It’s so very hard to sleep on a steel cot without a mattress…I think I’ve heard these words somewhere before (I’m plagiarising myself already!). Despite my fatigue, and despite having fallen asleep the night before in no-time-flat, the rest of the night I tossed and turned and wondered just why, with all my tossing and turning, morning had not yet arrived. Just before my alarm went off at 5:30 (how silly to think I needed an alarm to wake up! ), I heard the scratching of a broom in front of my door. By the time I stood up, folded my sheets, put some tooth paste on my tooth brush and opened my door, a small kolam had been traced in front of the steps. I realized that the entire village awakes at 5-ish, or at least the women do. Before six, all of the thresholds of the homes had been watered down and swept, and simple white kolams (very simple compared to the two previous days’ designs and only rice-flour white compared to the two previous days’ flamboyantly colourful creations) had been finger-tip sown on the ground. My neighbours in the early morning. At 6 sharp, Jayaretina came to fetch me and we went to her small “corral, ” a small enclosed area about three-hundred metres from my little house, where she kept her six cows (three cows and three calves), three hens, two roosters and thirteen chicks (seven of which had hatched three days before my arrival: mother and new-borns were kept under a turned-upside-down basket) and four goats…when she could trace their whereabouts in the hundreds of acres of scrubland they were free to wander during the daytime. All of JR’s (I will refer to Jayaretina by these infamous initials) small gestures and actions caught my eye: unlocking the gate, opening the wooden door of the chicken coop to let the birds jump out and scrape, untying the smallest calf, two weeks old, and leading her to her mother where she tucked her head into the udders and started suckling. Only two minutes went by when JR pulled the calf from under the udders, tied her up close by, sat on a low wooden stool next to the mother cow with a small copper-coloured steel pot in her hand and took her turn to pull the milk from the udders until the pot was full, about five minutes later. This would be used for our morning chai (prepared a half an hour later). The baby calf returns to her mother’s nourishing udders. Just as soon as she had placed the small pot on a bench, she led the baby calf back to her mother to let her finish her breakfast. Before untying the other five cows, JR collected the mounds of dung into a wide-mouthed aluminium tub. She would take the fertiliser-filled vessel to her vayal (fields) later in the morning. About five years ago, a friend of mine put into place a system of composting in an eco-friendly international boarding school in Kodaikanal about a three-hour drive from Mallangudi. She told me that after five years, the caretakers still didn’t understand the idea of composting, and that the nutritious organic matter just accumulated in the containers if she wasn’t there to explain, over and over again, just how to use it. I told her I wasn’t surprised, for the system of composting is merely one of many methods of recycling organic waste. The method used here is much older and certainly more adapted to the population of rural Tamil Nadu, traditionally (until quite recently) vegetarian. Rice-based meals were chemical-fertilizer-free and all waste was thus organic. Even now one has no lack of opportunities to see the ancient routine in practice: at roadside eating dives (called “hotels”) where meals are served on banana leaves. After finishing a repast, diners fold the leaves down the centre and deposit them in large barrels placed usually just outside the entrance to the establishment. A cow or two (usually but not exclusively belonging the hotel’s proprietor) is always on hand to feast on the leaves and the leftover rice, curries and sauces inside. The cow dung is always collected and either made into small patties that once dried are used as combustible matter, or else dispersed as fertilizer in gardens, farms and fields. Likewise, in all the homes in Mallangudi, not one bit of food is wasted. Whether leftover from the preparation of dishes (vegetable skins, seeds or stems, for example) or after mealtime (most meals are made fresh; refrigerators, when families have them, almost never contain leftovers), everything is amassed and fed to the cows. This ancient, waste-free cycle of transformation is easier, more efficient and deeply anchored in the collective memory of rural mind-sets than composting. It is no wonder, then, that my friend is having a hard time teaching the method in Kodaikanal. But back to Mallangudi and other observations on this, my third day in the village. Just as soon as JR had piled the clusters of dung in the metal vessel, Kavi and Deepika ran into the corral. Kavi, or Kavipriya by her full name, is seven and her little sister Deepika is five. Until two years ago, Deepika would cry or cringe when she saw me. I can’t say I like it, but it is so common that by now I am used to this reaction from small children in small villages. Few have the occasion to see a vellikari, especially in person. My strangeness obviously shocks them (particularly my pale skin and my blue eyes) and no words of reassurance from parents or siblings seem to mollify their terror. Au contraire! The more they are pushed into my arms or forced to “shake my hand”, the more their tears and screams of horror intensify…much to the amusement of their family and friends. And although I am the target of these children’s fear, I am also the only one to have pity on their small souls. Taunting and teasing are integral elements of interactions between people here. Though commonplace, it is never malicious. One only has to see how babies and toddlers are pinched until they grimace…and then immediately kissed on that same spot. Similarly, in temples where an elephant is on hand to bless devotees (by tapping them on the head with his trunk…after having sucked up a coin or two), one only has to observe how adults roar in laughter as their children shriek in dread when faced with the towering creatures. And it’s not just adults poking fun at children…mischievous provocation is as much intra- as inter-generational. Sensitive beings beware! Since they were on leave from school for Pongal holidays, Kavi and Deepika had appointed themselves my special Mallangudi guides during my short stay in the village and so were with me almost continually. Vimala, their mother (their father was one of the very few men who hadn’t come back to the village from Singapore for the holidays), had no qualms about the situation for three reasons. First of all, she likes me and knows the children like me. Secondly, there is absolutely no danger lurking in Mallangudi (except, perhaps, from the “ghosts” that Vishwanathan fears); the village is small and isolated and everyone knows everyone else. And finally, despite their youth, the girls are particularly poised and responsible. As are all the children in Mallangudi and every other village I know. The children are integrated into the family and the community even when very young. They are coddled and adored, but also given responsibilities at a very early age. They are never asked to do things, they are told: no question of yes or no, or wanting to or not wanting to, no please or thank you (in general, there are no pleases and very few thank yous in social interactions here in Tamil Nadu). The duties are age-appropriate and start with the basics: go inside and bring me some water, take this pot and put it over there, give this carrot to Periyamma…I don’t believe I have ever seen a child refusing, or even hesitating to carry out a command. The young girls naturally take a great part in the daily social chores (how that word betrays the act here! There is something arduous in the word “chore”, something negative, undesirable, as if desire or the lack of it is its primary ingredient! ): bringing water and food, preparing meals, drawing kolams, carrying and taking care of the smaller children. The young boys are left more frequently to their own devices but jump to action if told to do something. The girl/boy duty-divide only becomes more enhanced as the children become older. As adults, the schism is so deep that in Mallangudi, as in most villages I know, the women rule the home, the family and social network and, thus, the village itself. And the fact that the men are often simply not present just entrenches the status quo: Tamil women are the real leaders, the real foundation, of village life. They are exceedingly strong. Kavi and Deepika led me back to JR’s home, where we sat on the porch-like platform facing the house. Once there, we practiced our Tamil…oops, I mean I practiced my Tamil while they laughed and teased me. I could hear Indurani chuckling inside the house. I smiled, too, knowing how amused these people were by my very bad language skills and also how it didn’t seem to matter at all, really. The real communication was on a different, deeper, non-verbal plane and was rich and faultless: we really liked one another, we trusted one another, we felt good in one another’s company. When I had finished the scalding tea Indurani had prepared for me, JR arrived and we ate our breakfast of hot chappatis and spicy potato masala. No sooner had we finished eating (meals are consumed with lightning haste) and dousing our steel plates with water, JR lifted up a big metal vessel drying in the sun on the concrete bench in front of her house and told me to follow her. She was taking me to her vayal, her fields. We walked quite a distance from her house and the village, out beyond the small enclosure where she kept her cows, goats and chickens, beyond the Ayyanar temple and the Ganesh shrine, beyond the ghost-infested land that kept Vishwanathan trembling, beyond the big swimming/bathing/washing hole where I had accompanied the children on numerous occasions in the past (and that I will write about tomorrow)…the land was scorched (the monsoon had been miserly the past two years…even the eucalyptus trees were suffering) and were it not for the dense hoards of thorny scrub and cacti, it could almost be described as a wasteland. Fortunately there are micro-systems of irrigation all throughout the region. The one in Mallangudi was a half-an-hour walk from the village. When we finally arrived I was sincerely surprised at the density of green, the thriving paddy, the well-manicured footpaths, the total absence of plastic. The contrast between the vayal and the village was immense, as if the elements had been unequally distributed between the two: fire and earth weighed so heavily in the village, whereas the vayal had the lion’s share of water and air. Jayaretina showing me her rice fields. It was so quiet and peaceful that Krishna, JR’s husband, was napping in the shade of a tiled awning jutting out from a cabana-like structure that housed the motor that energized the irrigation pumps. Krishna opened his eyes with a start as our shadows passed in front of him. His abrupt awakening made me laugh. It seemed that the peace and quiet created an environment that was just too fragile for sound sleeping. I have always been fascinated by Indians’ sleep habits. The louder the music, the jerkier the train-ride, the denser and noisier the crowds, the better and sounder Indians are able to sleep…and that is true for the smallest of new-borns to the ricketiest of revered elders. Motion and commotion act as sedatives for all the people I know here. Perhaps it is merely a survival mechanism. Perhaps the reparative qualities of sleep are so essential that the phenomenon (I call it a phenomenon because I am a delicate sleeper. It’s hard for me to find real repose unless there is silence, darkness and…a mattress!) is just a reaction to the blaring music spewing from loud-speakers on street corners and lampposts; to the deafening non-stop screeching coming from every type of vehicle imaginable (I am sure that if bullock-carts could have air-horns, they would); to the turned-to-the-maximum shrieking dialogue of Tamil soap-operas on television in every single house…Life is loud here. Life is crowded and life is noisy. Every drop of noise, every speck of crowding softens into lullabies and cuddles – a sense of security while one is at her most vulnerable. Krishna stood up, grinned and walked away. He is a man of few words. These past days his words were even fewer than usual. This bothered JR; she didn’t know why he was so taciturn and standoffish. I was worried that the gifts I had brought or even my simple presence had something to do with it (Though I tried as hard as possible to remain as discrete as possible, I knew that my being here changed family and village dynamics) but JR assured me that it was not that at all. He had worries, she told me. He had stress. I was flabbergasted to hear her utter that word: stress, here? I held the intimate notion that stress was synonymous with urban complexities and pressures, with rampant competition, with the feeling of running against the clock. None of these elements were part of Krishna’s life and yet he felt under stress. I would learn only later that the stress he feels is a sentiment of helplessness faced with the degrading health of his second son. Ravi was born with not only a deformed foot but also congenital renal insufficiency. It is only a matter of time when he will need dialysis. And the kidney transplant that can ultimately save his life is an impossibility. 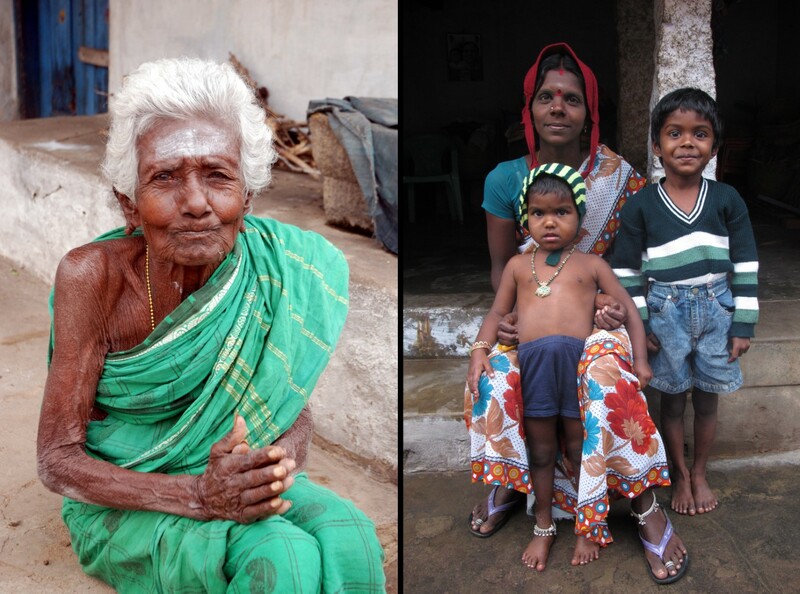 Three days before I arrived in the village, Muthu had accompanied Ravi to the hospital. The reports were grim. JR took a long pole with a metal hook at the end and a large metal basin and said to me: come. 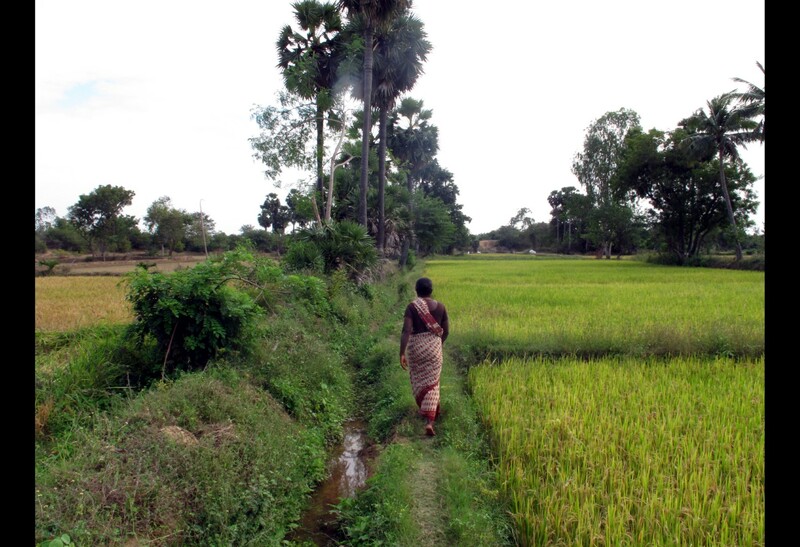 As I followed her along the narrow mound of earth separating the ripening paddy fields, she proudly pointed to one emerald square and then another, saying inde, ande: this one, that one; it seemed to me that they owned two or three acres of rice field. I felt relieved. JR and Krishna were among the most humble couples in Mallangudi so it was reassuring to know that with their cows, goats, chickens, small vegetable garden and paddy, they were relatively secure. Vangue, said JR, come. We walked a little further and she motioned me to stop in front of a feathery-leafed tree that I recognized, even naked of the long edible pods called drumstick that we eat in the summer months. JR lifted the pole and with its hook delicately ripped off the branches laden with tender leaves and white flowers. Later, we zipped off the leaves and flowers from the stalks before bringing the heap of flowery greens home where, using just a spoonful of oil, some garlic, onions and ginger, JR prepared tender murungakkai flowers that I would feast on for lunch. Jayaretina plucking murungakkai flowers in her vayal. —– Zipping off the tender leaves. I was expecting a lazy afternoon in Mallangudi but that was not to be. Muthu had organized an outing for us (us being me, Ravi, Muthu, JR and Saraswati) at Chittanavasal, an hour’s drive from the village. I had been to the site a few times in the past years but my experience this time would be different, coloured by viewing it through the eyes of my village friends. In fact, they really were not impressed by the “Jain beds,” the shallow rectangular spaces carved into the crevassed floor on top of the mighty granite boulder. Shaped more than a thousand years ago by Jain monks whose austerities included months of meditation in the hollows of these granite hills, the beds had become mirror-smooth from a hundred years of use. The monks, too, slept without a mattress. Ravi’s deformed foot didn’t let him climb to the top with us. He waited at the bottom of the site where a small boating pond had been created, and watched the vacationing families scream with laughter as they pedalled into each other in fibreglass paddle-boats. Muthu, Saraswati, JR and I made our round-trip walk in record time: barely had we caught our breath upon reaching the beds, we turned right around and sped back down the boulder. I had just the time to notice that the ASI (the Archeological Survey of India, the national organization responsible for restoration, renovation and maintenance of monuments and other historical sites) had erected a steel railing-like barrier in front of the satiny-bottomed beds. I noticed, too, that despite the barricade, the beds were scarred and defaced, scratched all over with phone numbers, names and lop-sided hearts containing the all-too common “Suresh loves Amu.” I felt terribly angry seeing the graffiti. Perhaps I shouldn’t have been so sensitive for it was just one more example of the oh so rampant phenomenon of vandalism that’s mushroomed these past few years at nearly every site I know, temples and shrines included. I tower over Saraswati and Jayaretina. —– Vandalized Jain beds at Chittanavasal. —– Jayaretina with her two sons. It started, or so I witnessed, with numbers: phone numbers rudimentarily drawn on the walls in back of the stone oil lamps in temples, the carbon deposits of burnt cotton wicks, like greasy ink, used to stain digits onto the old rough surfaces. At first I was baffled by the black scrawl, sincerely and naively believing that it was cabbalistic code with roots in enigmatic writings or rituals reserved for a select group of the initiated. And then names – still traced with oily carbon fingertips – appeared alongside the numbers and I finally understood the scribble for what it really was: plain ole graffiti, with not even a hint of symbolism or esoteric clout. Very soon, black writing could be found all over the walls of all sorts of temples all throughout Tamil Nadu. I was heartbroken the first time I saw a mass of dark scribbles on remnants of fourteenth century vegetable-dye wall paintings. Now I am just angry. And if finger-painting weren’t enough, it appears that etching seems much more fashionable nowadays. Names and hearts and numbers and smiley-faces have been scratched right into eight-hundred year-old, UNESCO World Heritage temple walls and one-hundred year-old, ten-foot high terracotta horses in secluded Ayyanar shrines. The few times I interrogated watchmen about the epidemic, all I received were meek smiles, shrugs and wrists turned up to the sky, a frequent gesture meaning “what to do?” I once read that graffiti is an age-old practice; hundreds of names and messages carved into the Pyramids attest to that fact. Why, then, I ask myself, should it be different here in Tamil Nadu? I have no response to that question. A little voice in the back of my head merely repeats: it just should. And it was special. The small puja room was already brimming with children when we arrived. Sukkanya tucked herself into a small spot on the floor and I sat on a stool just outside the open door. I never would have found room inside. Plus I had brought my video camera and needed a little bit of leg-room to film. The evening concluded with the entire assembly sitting in a big circle and eating the warm chickpeas and prasada (a sweet, sticky mixture of rice, cashews and jaggary) that Mutthaiya’s wife dished out onto small banana leaves placed on the ground in front of us. Afterwards, and saved forever in my memory and the video sequences, sheer magic remained: the thick yellowish flame of oil lamp wicks and pungent odour of smoking camphor pellets; the children’s loud, rolling voices and their attentive, smiling faces; the melodious, undulating repetition of Murugan’s countless names and the pride and sweet satisfaction written all over Mutthaiya’s face. Haro Hara, Haro Hara.